I spent this past Saturday morning in idyllic circumstances – sunny, warm, breezy and on two wheels. I’m a casual cyclist – I like doing it when I can avoid traffic, take my time and want to explore. 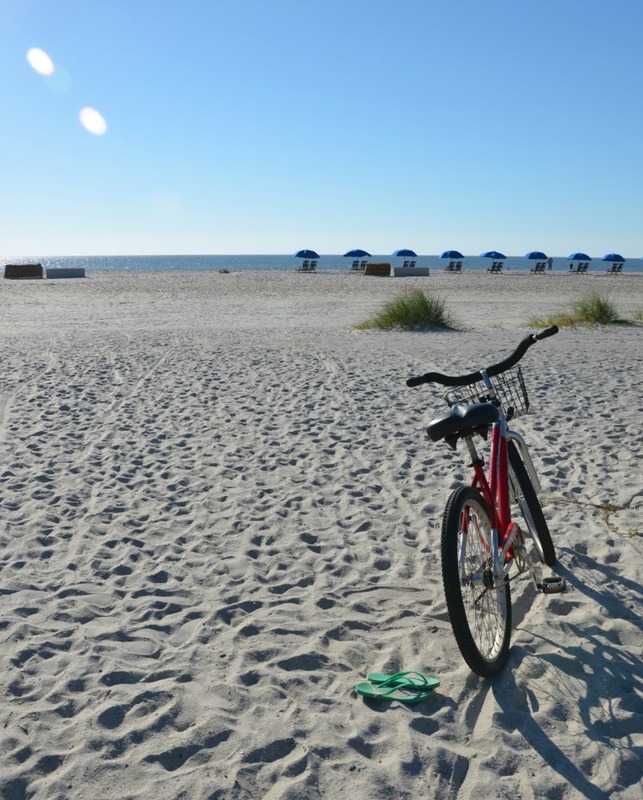 So when I was told on Hilton Head Island that cycling on the beach was possible, I was excited to try it. 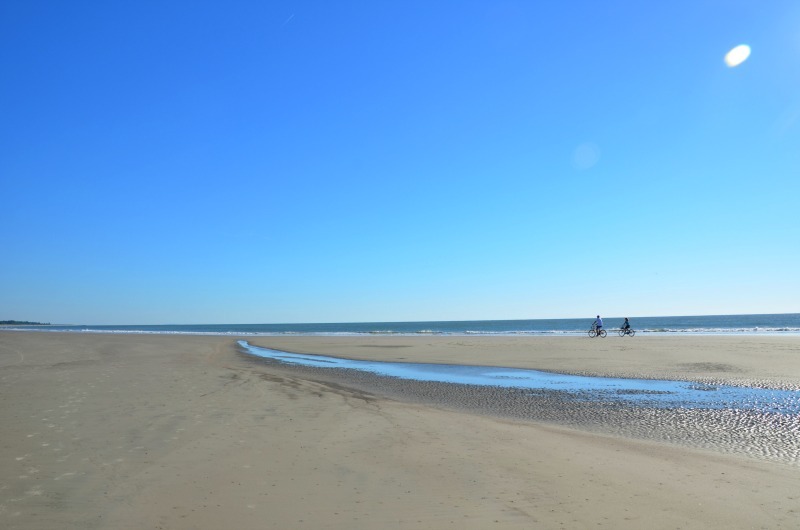 I first kept to the higher part of the beach, but then realized everyone was closer to the water, so I joined the path, being careful to give space between myself and those were walking and running. I could stop anywhere and did frequently to take photos – and I smartly heeded the advice to bike into the wind – which gave my legs a workout and was rewarded with an easier return on the bike. Since I left just after 9am, the beach was empty in many spots, a perfect time to enjoy the quiet of the morning, the crash of the waves and avoid annoying those who want to play, sun and quietly sit at the beach. 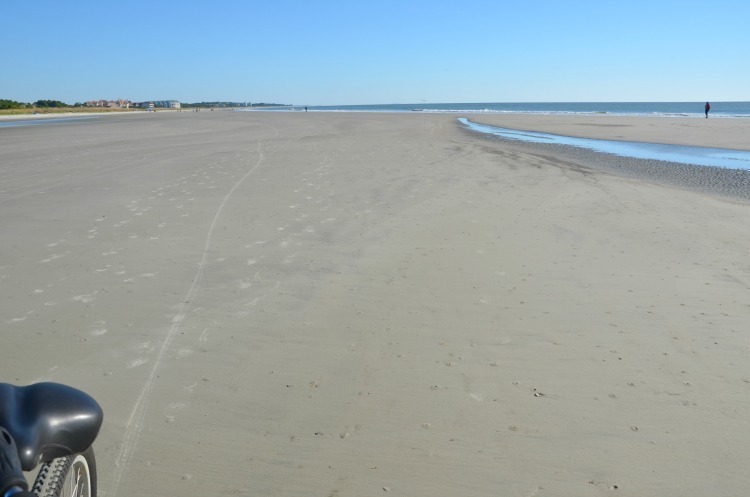 Thanks to the hard-packed sand, cycling on Hilton Head Island is just as easy at the beach as it is on the paved trails which crisscross this 12 mile island (which has 100 miles of trails). As I finished my morning bike ride, I wasn’t surprised that I had worked up a bit of a sweat, was thirsty, a bit tired and had a grin on my face. Life on two wheels, especially at the beach, is a clear the mind, appreciate the beauty and good for the soul gift to yourself.